22 | TH E M R EP O RT FEATURE violations, especially when dealing with some of the complicated financing options currently offered to help consumers. To make matters worse, a vio- lating product, activity, action, or advertisement can have a waterfall effect for enforcement. A single violation may bring about mul- tiple enforcement actions under UDAP and UDAAP rules, leading to extensive fines and penalties. For example, a violation found to be deceptive may also be found to be unfair and/or abusive. Other laws with UDAAP implications include: • TILA, Reg. Z (Advertising) • Mortgage Acts and Practices Act • Fair Debt Collection Practices Act • Various State UDAP laws All of these laws, in some way, shape or form, spell out the rules and requirements for advertising and disclosing product informa- tion and/or services to consumers. Any violation may end up being a UDAP and UDAAP infrac- tion and bring about a related enforcement action, with fines and penalties from both the FTC and the CFPB that can reach into the millions, or more, depending on the violation and the number of consumer loans involved. Every lender would be wise to become fully familiar and compliant with the requirements of these laws, particularly as they relate to communications, marketing, and advertising done by the company and its individual originators on social media. Be Vigilant with Communications T hese laws were enacted to protect consumers from un- scrupulous lenders' advertising and activities meant to mislead, take advantage of, and harm the consumer. Sad but true, such lenders and their activities do exist in our industry. Unfortu- nately, some good lenders also unwittingly get caught up in the net of UDAP and UDAAP enforcement. This is due to a lack of understanding or full knowledge of the rules or from activities taken by employees thinking they are acting in the best interest of the company. The CFPB recently fined three well-established reverse mortgage lenders—American Advisors, Reverse Mortgage Solutions, and Aegean Financial—for deceptive advertising tactics that misled consumers about the reverse loan products they offer. According to statements made by Richard Cordray, the CFPB's director, these companies tricked consumers by advertising that they couldn't lose their homes, would have no monthly payments, and could stay in their homes for the rest of their lives. Those statements are not true, according to the CFPB. 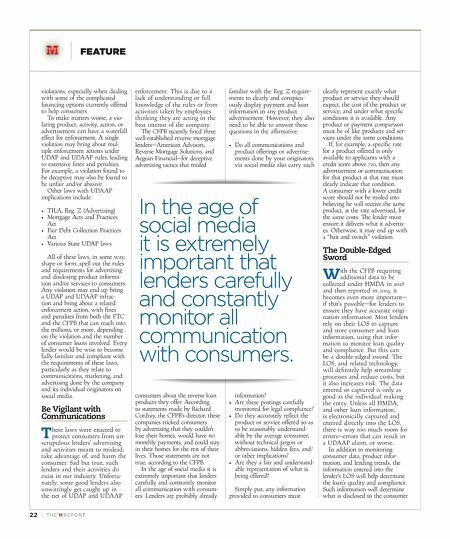 In the age of social media it is extremely important that lenders carefully and constantly monitor all communication with consum - ers. 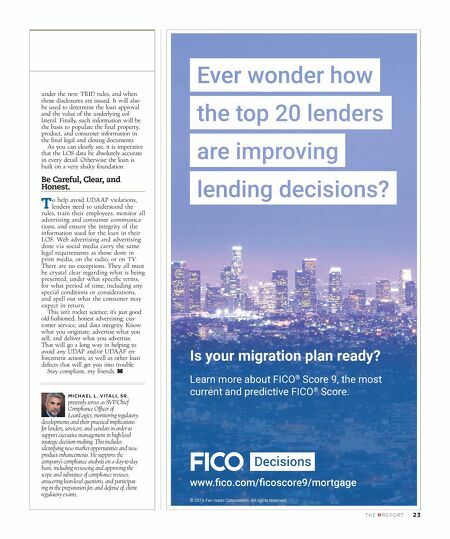 Lenders are probably already familiar with the Reg. Z require- ments to clearly and conspicu- ously display payment and loan information in any product advertisement. However, they also need to be able to answer these questions in the affirmative: • Do all communications and product offerings or advertise - ments done by your originators via social media also carry such information? • Are these postings carefully monitored for legal compliance? • Do they accurately reflect the product or service offered so as to be reasonably understand- able by the average consumer, without technical jargon or abbreviations, hidden fees, and/ or other implications? • Are they a fair and understand- able representation of what is being offered? Simply put, any information provided to consumers must clearly represent exactly what product or service they should expect, the cost of the product or service, and under what specific conditions it is available. Any product or payment comparison must be of like products and ser- vices under the same conditions. If, for example, a specific rate for a product offered is only available to applicants with a credit score above 720, then any advertisement or communication for that product at that rate must clearly indicate that condition. A consumer with a lower credit score should not be misled into believing he will receive the same product, at the rate advertised, for the same costs. The lender must ensure it delivers what it advertis- es. Otherwise, it may end up with a "bait and switch" violation. The Double-Edged Sword W ith the CFPB requiring additional data to be collected under HMDA in 2018 and then reported in 2019, it becomes even more important— if that's possible—for lenders to ensure they have accurate origi- nation information. Most lenders rely on their LOS to capture and store consumer and loan information, using that infor- mation to monitor loan quality and compliance. But this can be a double-edged sword. The LOS, and related technology, will definitely help streamline processes and reduce costs, but it also increases risk. The data entered or captured is only as good as the individual making the entry. Unless all HMDA, and other loan information, is electronically captured and entered directly into the LOS, there is way too much room for errors—errors that can result in a UDAAP claim, or worse. In addition to monitoring consumer data, product infor- mation, and lending trends, the information entered into the lender's LOS will help determine the loan's quality and compliance. Such information will determine what is disclosed to the consumer In the age of social media it is extremely important that lenders carefully and constantly monitor all communication with consumers.